The Halo is a finalist for Lambda Literary’s 29th Annual Award in Gay Poetry and on the longlist as a finalist for the 2016 Julie Suk Prize. 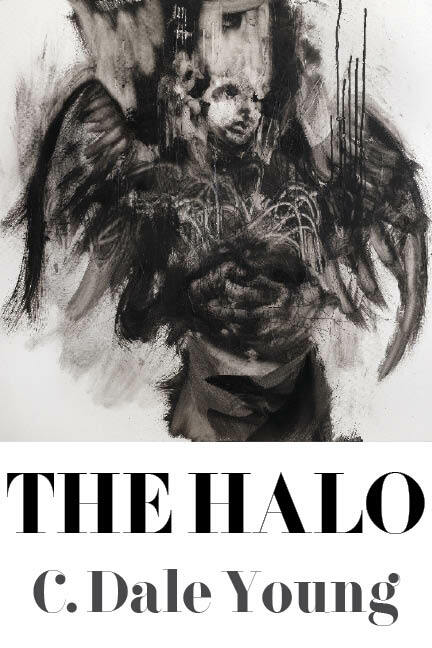 The Halo is a quasi-autobiography about a man who has wings and desperately wants to be simply human. Tracking from adolescence through adulthood, it explores an accident that temporarily paralyzes him and exposes him to human weakness all the way to his transformation into something more powerful than even he realizes. It explores a personal evolution from being prey to becoming the hunter. as they rode over its edge rather than surrender. "In this beautifully written and unsettling collection, Young (Torn) moves through the moments of his speaker's oft-broken life as he struggles to come to terms with the truths of his body and the world in which he exists...." - Publishers Weekly, May 2016 Read the full review. "...What Young’s poetry reminds us is that though things might 'get better,' the material effects of social oppression are inescapable and tragically destructive. Love, deep connections, passionate desires can all be all too temporary, so what do we hang onto but by (poetically) remaking our wounds and traumas into something we can live with, to keep us warm and cozy during those long stretches [into] darkness, to find a way to see what can’t be seen (but so often felt) in the intimate space between our shoulder blades." Read the full review. "...The collection showcases Young’s skill with forms and repetition – the obsessions of the book are as tightly wound as clock springs onto these poems, the same kind of constraints and limits that a young man recovering from a spinal injury might feel as he watches the world from his hospital bed. The poems return to the same images, the same problems, and the same questions relentlessly, refusing to allow the reader, like the speaker, to escape the cage of the speaker’s damaged body and anguished mind...." Read the full review. "...That Young manages to weave such lofty and, at times, uncanny themes with a deft hand is a testament to his skill. After long lines, which soar with ideas and complex histories, he often grounds the entire fantasy with a brief quip or even a humorous phrase, interrupting a rhythm that, were it any longer, would become unwieldy. Economical sentences evoke profound images. Etymology serves as a gateway to illumination...." - Read the full review. "...Young’s poetry is heartbreakingly human. It is both sweeping and intimate in its scope, both refreshingly original and timeless in its focus." – Southern Lit Alliance Read the full review.